In what has been a more difficult season than the Anaheim Ducks have had in recent times, there have been plenty of positive storylines as the club makes a push towards a hopeful playoff berth. Rickard Rakell has built on last season’s success, once again leading the team in goals (22 in 58 games) and now adding more assists to lead the club in points (48). Ryan Getzlaf, at age 32, has shaken off some injuries and is still producing at a point-per-game clip. John Gibson, despite some nagging injuries, has shown that he is a top-flight goaltender in the NHL. Ryan Miller has excelled in his backup role with the Ducks. 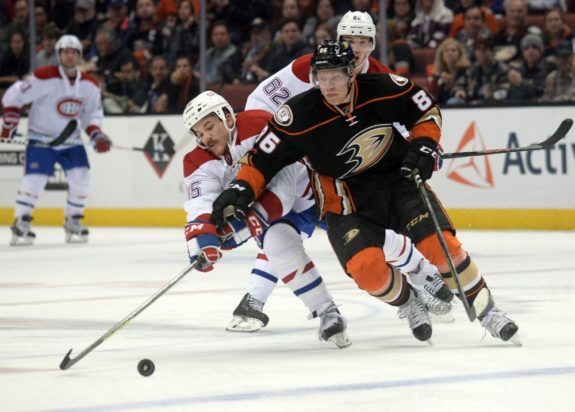 Hampus Lindholm has continued to evolve under the radar as a top defenseman in the league. Adam Henrique has fit in seamlessly since Anaheim acquired him from the New Jersey Devils. One of the best and most exciting individual player performances, however, has come from right winger Ondrej Kase. Kase was a late draft pick of the Ducks back in 2014 when he was selected all the way in the seventh round (205th overall). He always showed scoring ability in Czech junior leagues, and while he’s not particularly big (6-foot-0, 185 pounds), it does not seem as though his size would have conceivably been a deterrent. For whatever reason, he slid down in the draft, and the Ducks now look awfully smart for getting so much return on this seventh-round investment. In the 2015-16 season, Kase came over to North America to play for the Ducks’ AHL affiliate, the San Diego Gulls. He scored 14 points (8 goals and 6 assists) in 25 games with the Gulls. He then made the jump to the NHL in 2016-17, spending the majority of his season there with the Ducks. In his debut NHL season, Kase appeared in 53 games, notching 5 goals and 10 assists for 15 points. He got some playoff action as well, and while he only appeared in nine contests, he scored a pair of goals to help make his presence known. His flashes of speed and skill, along with his constant energy, were indicators that 2017-18 could be a breakout campaign. That promise has indeed come to fruition. Kase has overcome some injuries (like almost everyone on Anaheim’s roster), including some concussion issues, to explode for 17 goals and 14 assists in 47 games heading into Sunday’s home tilt versus the Edmonton Oilers. That point total is good for fourth-best on the Ducks, behind only stalwarts Rakell, Getzlaf, and Corey Perry. Following Anaheim’s 4-3 overtime victory in Buffalo on Feb. 6, in which Kase picked up a goal and an assist, Ducks head coach Randy Carlyle expressed how excited he and the organization are over how much the 22-year-old Czech has been able to help the team at such a young age. In exponentially increasing his scoring totals from last season, Kase has seen his shooting percentage skyrocket from a meager 6.5 percent in 2016-17 to 16.2 percent this season. Some of that might be attributable to better luck, but the underlying numbers suggest that much of the reason is probably rooted in Kase’s continued improvement and his ability to help create high-danger opportunities. His 5-on-5 high-danger shot attempt share of 55.61 percent leads all Ducks players who have appeared in at least 20 games and is a noticeable jump up from his essentially even mark of 50.23 percent last season. Kase also leads all Ducks players in overall 5-on-5 Corsi-for percentage (53.51 percent) and expected-goals-for percentage (55.87 percent). 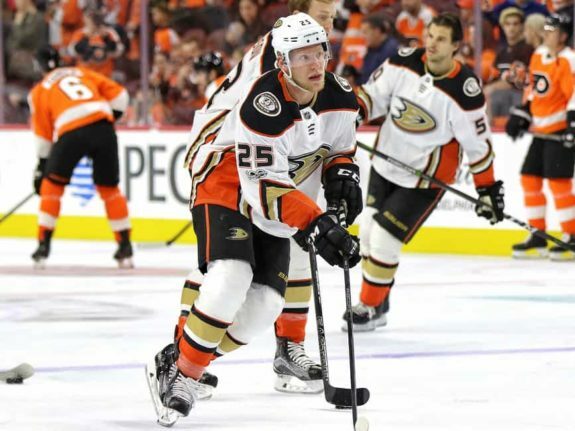 He has proven to be a catalyst for the Ducks as a whole and, more specifically, for their recently formed third line that also features Henrique and Nick Ritchie. Henrique’s smarts and skill level, Kase’s skill and energy, and Ritchie’s power-forward style have become a deadly combination. Kase is the ever-coveted player who passes both the eye test with his high-energy style AND the advanced stats test. He generates a lot of offense and is not often on the ice when opponents apply heavy pressure against the Ducks. It should be noted that Kase sees the highest percentage of offensive zone starts (52.54 percent) among all regularly-playing Ducks forwards. So Carlyle is giving him more sheltered minutes as a young player whose game is still (rapidly) growing. But that should not take away from what Kase has been able to produce for an Anaheim team that has needed a spark plug in an arduous season. Plus, is it really enough to offset this fact? .. Ondrej Kase is 1st. That’s some pretty good company. Kase’s teammates, including Jakob Silfverberg, have enjoyed watching Kase quickly turn into an impact player in the NHL. “We’ve always kind of seen that he has offensive abilities in him but maybe not have the confidence to kind of blow up or whatever you want to say,” Silfverberg said earlier this month. “Especially this year. He’s really grown as a hockey player and you can see that he plays with a lot of confidence. With Kase only 22, expect him to produce many more big goals in the years to come.